Can you confirm these amateur observations of Bronchocela marmorata? 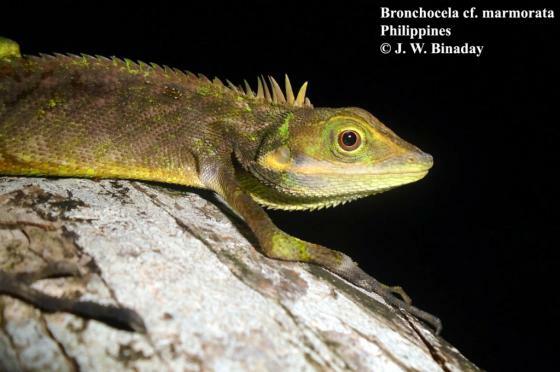 Type locality: “Manila, ... Daraga auf Luzon, ... von den Philippinen” [Calotes (Bronchocele) Philippinus PETERS 1867]. Diagnosis Diagnosis. Avariable species, morphologically similar to B. cristatella with a SVL of 75.1 - 119.6 (mean = 100.82, n = 56) and a long tail (ratio tail SVL: 331.97, n = 39). 8 - 11 supralabials and 8 - 10 infralabials. Tympanum large, more than half diameter of orbit. Canthus rostralis sharp, a series of 2 - 4 small erect, compressed scales behind supraciliary edge forming a small longitudinal crest. Gular sac moderate in adult males and sometimes absent in juveniles and females, covered with small keeled scales, smaller than ventrals. Nuchal crest scales small, erect, flattened and directed upwards, longest at about diameter of orbit. Dorsal crest low, continuous with nuchal crest, decreasing caudally, formed in adult males by lanceolate spines. In juveniles and females dorsal crest formed by erect scales. Body scales mucronate, keeled, homogenous in 47 - 73 midbody scales (mean = 60.45, n = 56), 0 - 2 uppermost scale row next to dorsal crest pointing upwards, 2 - 5 rows directed parallel, others scale rows downwards. Ventrals 1 - 5 times larger than dorsals, strongly keeled. It can be distinguished from other congeners by the combination of moderate nuchal and dorsal crest, moderate gular pouch and maximally 2 upper body scale rows pointing upwards. Comment Specimens from Negros were all B. cristatella (Hallermann 2005). Hallermann (2005) also states that B. m. sanchezi cannot be distinguished from B. m. marmorata and therefore is a synonym of the nominate form. Distribution: not on Panay (M. Gaulke, pers. comm., 26 Dec 2012).